Project Immigration 2012: What does migration mean? Migration, immigration, multiculturalism and integration, all these are words quite often used in our blog. But since each word has a multitude of layers when it comes to its meaning it is reasonable to differentiate them and determine their meanings more clearly. 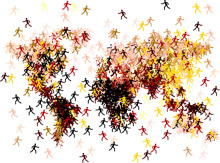 For instance migration means the movement of persons from one country to another. Emigration means the migration from your native country in order to settle into another. Immigration stands for migration to a country of which you are not a native in order to settle there. Integration is the action of incorporating a ethnic, racial or religious group into a community. It does not ask for abandoning one’s own cultural identity but demands the willingness to learn the language of the country of refuge. Moreover it requires the acceptance of its legal system. Multiculturalism refers to cultural diversity within a community. The doctrine that several different cultures (rather than one national culture) can coexist peacefully and equitably in a single country is also associated with the term multiculturalism. So we hope that you got a quick overview on each term.